Siddgeir is the Nord Jarl of Falkreath and an Imperial Legion supporter. 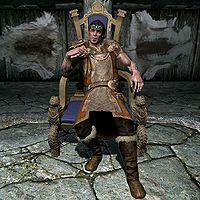 He has two uncles, the first of which is Dengeir of Stuhn, the former jarl of Falkreath. The second is Dengeir's brother, Thadgeir, an old warrior. Siddgeir claims to have deposed his uncle, Dengeir, due to his old age, but Dengeir believes it was actually Imperial machinations. Siddgeir, though, is more lazy than anything and uses his position as jarl in order to reap the benefits. Dengeir may comment on this, saying, "My nephew has always been handed things, even the title of Jarl." Siddgeir leaves all actual work to his steward Nenya, and his housecarl Helvard. Siddgeir is also unscrupulous having some type of working relationship with local bandits, and will request your help in dealing with them. If the Stormcloaks take Falkreath, Siddgeir is deposed and Dengeir will become Jarl once more. Siddgeir himself will thenceforth be found in exile in the Blue Palace of Solitude. If Falkreath is given to the Stormcloaks in Season Unending and retaken by the Legion, however, Siddgeir will return as Jarl and Dengeir will be exiled to Candlehearth Hall in Windhelm. He wears a refined tunic, a pair of fur-lined boots, and a jade and emerald circlet. He is equipped with an iron dagger, and carries a key to his longhouse, as well as a selection of higher class items and gold. He may greet you by saying: "Yes? What is it that you want?" or "Boland speaks much about the war and the Stormcloaks but he knows who provides." or "The Stormcloaks want freedom but don't understand its price." or "There are opportunities everywhere. Why don't you go find them." or "No time, I have business to conduct." or "Stand aside. I don't need to speak to you." Siddgeir may dismiss you by saying: "Come and see me again sometime. I might have some use for you." or "We're done here, I think." If he is still a jarl, you may ask him if his inexperience makes his job difficult. He will answer, "Difficult? I am a Jarl. I eat the most succulent meat, drink the finest ale and hunt with the best hounds in the hold. Meanwhile, my very capable steward sees to the needs of the smallfolk and ensures that my hold runs smoothly." He will end with amused condescension: "Being a Jarl could hardly be simpler. You should try it sometime." If asked how he became jarl while so young, Siddgeir will reply, "My uncle Dengeir was Jarl until a short time ago. His old age and failing health caught up with him, and he stepped down. He now serves us honorably as Thane, and to the great benefit of the hold, I now serve as Jarl." Siddgeir: "Why have taxes not come in from Granite Hill, Nenya? We should send some guards down there." Nenya: "They are only a little late, Jarl. The trade routes are affected by the war, we should give them another day." Siddgeir: "Very well, but when their emissary arrives I want words with him." Kill the Bandit Leader: Slay a bandit leader for Siddgeir, the Jarl of Falkreath. Rare Gifts: Do a favor by finding a rare item. Thane of Falkreath: Prove you are worthy of the title Thane by assisting the people of Falkreath Hold. When you ask him for work, he will scoff: "Work? I demand tribute before you can be considered for any real tasks. How about drink? None of that local piss. Real Black-Briar Mead, fresh from Riften." If you tell him you'll bring it to him, he will say: "You better. I hate people who waste my time." If you refuse by telling him it's too bad, he will say: "Then I don't have time for you." After accepting and coming back with a bottle of Black-Briar Mead, you can tell him you have his mead and he will say: "Now that's what I like to see. Someone who gets things done. Here. A little something for you." He will give you two or three leveled potions as a reward. This quest will become unavailable if Build Your Own Home (Falkreath)HF has been started. After bringing him a bottle of Black-Briar Mead, which is the previous task, you can ask him if he has any more work. He will then say: "You've proven reliable. There's a group of bandits in my Hold that I... may have had a few discreet dealings with. The cut they were giving me was good at first, but now it's time to clean things up. Go and take care of it." If you tell him it will be done, he will then say: "Good." If you refuse by telling him you can't do it right now, he will say: "Disappointing." After you have accepted, but before you have reported back and killed the bandit leader, when exiting conversation with Siddgeir, he will only say: "Execute every last bandit. Spare no one." Upon killing the bandit leader and returning back to Siddgeir, you can tell him the bandit leader is dead, and he will say: "Teach them to stop paying me. Here. You deserve a reward for your service." Siddgeir will then give you a leveled amount of gold as a reward for killing the bandit leader. After killing the bandit leader for him, which is the previous task, you can ask him if there is anything else he needs, and he will say: "There is room in my court for a new Thane. It's an honorary title, mainly, but there are a few perks someone like you could make use of. However, I could only grant the title to someone who is known throughhout my Hold. You help my people, and I'll make you my Thane." If you then tell him it would be an honor, he will say: "On your way, then." If you tell him you don't have time for that, he will say: "Very well." When you return after helping the people of Falkreath five times, you can tell him you've helped his people. He will then say: "Then by my right as Jarl. I name you Thane of Falkreath. Congratulations. I grant you this weapon to serve as your badge of office. I'll also notify my guards of your new title. Wouldn't want them to think you're part of the common rabble." As part of becoming Thane, Siddgeir will then give you either the axe or the sword of Falkreath. During this quest, Siddgeir may be found at a party hosted by Elenwen in the Thalmor Embassy. If he is friendly towards you, and your Speech is at least 50, you can persuade him to create a distraction. Should you approach him, he may tell you, "These Thalmor know how to treat a guest. ", "A ruler is entitled to luxury, don't you think? The Thalmor understand that. ", "Why would anyone join the Stormcloaks? They have a fraction of the Empire's wealth and power. ", or "If I had my way, I'd spend all my time at parties like this, and none of it dealing with the common rabble." Excusing yourself will be replied, "Until later, then." You may ask him if he resents the Thalmor, and he'll answer, "Yes, I know what you mean. Most Nords struggle to accept change. Those who fought the Thalmor in the Great War still see an enemy. But that war is over, and a new day has dawned. Besides, the Thalmor reward their friends richly. Anyone who doesn't take advantage of that is a stubborn fool." When asked if he has known Elenwen long, Siddgeir will say, "I've known her long enough to appreciate her excellent taste in food and wine. And also long enough to respect her importance to Skyrim. She plays a vital role in rooting out the forbidden worship of Talos." and add, "As far as I'm concerned, those Talos-worshippers get what they deserve. All they do is cause problems for me and the other Jarls." Siddgeir: "It's all for a good cause, old chap." Siddgeir: "Ulfric Stormcloak? The rightful High King? That's bordering on treason, man! Stand up. Stand up, I say!" Razelan: "I don't understand... did you say Ulfric Stormcloak? Fine fellow, although a bit too fond of... I mean, no, of course, I condemn him in the most..."
Siddgeir: "You take it back then? You retract your statement? Well?" Siddgeir: "Tell your men to stand down. I don't need any help dealing with this kind of fool. He isn't worth the trouble. I apologize for the disruption to such a festive occasion." After the distraction, talking to Siddgeir again will have him mention to you, "You asked for my help. Not for nothing, I hope?" This page was last modified on 3 December 2018, at 18:44.